Readco Kurimoto LLC unveils the RK-1 continuous mixing processor. Offering the company's proprietary mixing technology in a compact, tabletop unit, the RK-1 was developed to help product development professionals test new and existing formulations being processed in batches using a continuous process in a controlled, laboratory environment. Scaled down to process 10 lb/hr, the RK-1 combines heat transfer, mixing, and shear to process multiple powdered, liquid, and viscous ingredients in a single step, while yielding a high-quality, homogeneous product at discharge that meets targeted specifications for moisture, texture, color, uniformity, and other criteria. 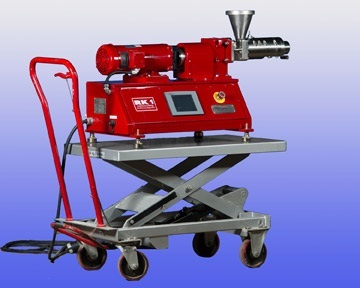 The novel RK-1 features twin-shaft, co-rotating screws with a one-in.-diam set within a closed barrel to promote the intimate contact among wet and dry materials needed to achieve the desired level of mixing, blending, reacting, crystallization, and/or encapsulation. Ideal for use in research and development labs for foods, chemicals, pharmaceuticals, specialty polymers, and other products, the versatile RK-1 includes touch-screen controls for setup, monitoring, and real-time adjustments as standard, plus a mobile lift table, electric band heater, feed chute, and all-stainless steel construction are among available options.